Trashcan Carla. You’ll probably find her on the road leading out of Concord, along with her pack beast. Carla is a vendor who will sell you things. She pops up here and there. She doesn’t offer fantastic stuff, but it’s still good to keep your eyes open for her. She’ll also offer directions to Diamond City. Drumlin Diner. There’s a potential shootout in progress here, and you can choose to side with a semi-douche named Wolfgang or help the owner of the place, Trudy, kill off her attackers. This triggers the quest Order Up. Might as well do it while you’re here, as it’s really short. Down the street from Drumlin Diner is a small house on the side of the road. Inside you may find Ron Staples. He sells groceries, more or less. Yay, vendors aplenty! There are also some medical supplies in this house. Just after the freeway leading to Lexington you’ll see Jalbert Brothers Disposal up a hill on your right. It’s overrun by Mole Rats, and aside from some Jet and Psycho in the trailer and some ammo at the top of the ramshackle water tower thing, there’s little to see here - except, of course, for the shack, which is brimming with radiation. If you duck in here you can find a terminal containing Brother Edmund’s Journals, though it requires an Advanced hack to access. Get through for information on the Word of the Holy Atom, as well as a way to open a safe that's set into the floor beside the terminal. Past Graygarden and on your left you’ll see the beginnings of a suburb. This is College Square, a massive haunt for Ghouls, and, currently, a bit of a battleground around the Cambridge Police Station. (I recommend approaching this area from the right side of the buildings, as you’ll slip right into the Police Station grounds without having to deal with the mass amounts of Ghouls lurking on the main streets.) Saving the soldiers here is part of the quest Fire Support, which you may have gotten by checking your radio earlier. This will get you on the Brotherhood of Steel quest line. South on the street from the Cambridge Police Station you’ll find Fraternal Post 115. There are no quests inside, but you can rumble with some Super Mutants for a nice, large cache of ammo. The Wreck of the USS Riptide kind of helps span the gap between Cambridge and Diamond City. You can get across the bridge itself safely, but if you try to hop down onto the Wreck itself you’ll find a bunch of Raiders camped out along the remains of the hull. One has bits of Power Armor equipped, so remain on your guard. 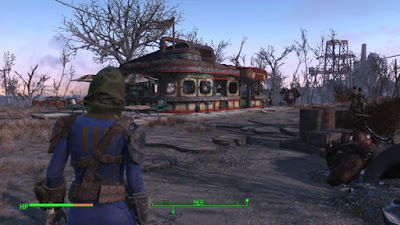 Continue south from this bridge and, after a possible encounter with a Mongrel, you’ll start seeing Diamond City Guards and Turrets that don’t attack you. Keep following the signs and you’re at Diamond City. Woot!